During the summer of 2016, the High Line Canal Working Group, which includes representatives from each jurisdiction along the Canal’s reach, completed a comprehensive tree inventory project. This project identified, mapped and assessed all trees with diameters greater than six inches along the High Line Canal corridor. Data was collected on 23,677 trees throughout the High Line Canal corridor, which has served as a valuable tool in assessing the health of the tree canopy. Data analysis completed by the High Line Canal Conservancy shows that the Canal corridor is more diverse than previously thought. There are 97 different species of trees throughout the Canal. The chart below is the top 10 species of trees that make up 86% of the total tree count. 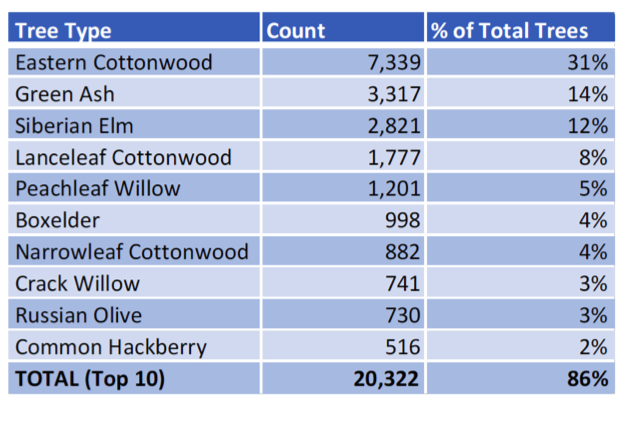 Cottonwood varieties make up 43% of the total canopy of the Canal. The cottonwoods pose challenges for future planning efforts because of their high levels of water consumption and relatively short lifespan. In addition, many of the cottonwoods along the Canal are reaching the end of their natural lifespan of 70 to 120 years. Using the data, the High Line Canal Conservancy calculated the average tree density for each of the jurisdictions. The density varies greatly by jurisdiction as different parts of the Canal have received water longer than others. The northern reaches of the Canal have not held water in over a decade, which has dramatically changed the canopy composition. 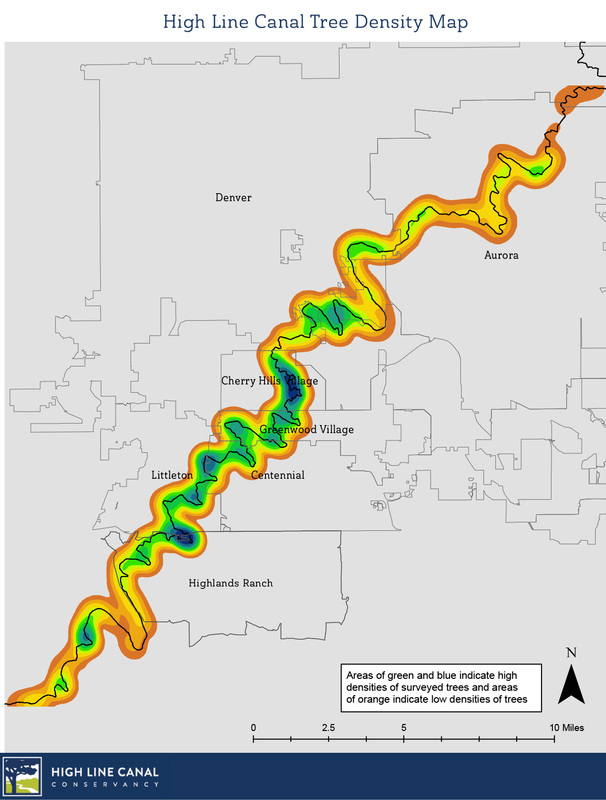 South Suburban Parks and Recreation District and the City of Cherry Hills Village have the greatest density of trees along the Canal, where it is between 440 trees per mile to 601 trees per mile. The chart below indicates the total number of trees by jurisdiction. The following map depicts the entire High Line Canal with areas of green and blue indicating high densities of surveyed trees and areas of orange indicating low densities of surveyed trees. This analysis has been developed by the High Line Canal Conservancy to advance the tree inventory data as a critical planning tool for tree care and enhancement along the Canal corridor. To learn about the plan for tree care along the High Line Canal, click here. Have a favorite memory from the Canal? We'd love to hear. 2019 Summer Walking Series – join us for another walk along all 71 miles!